Blade construction: Katana at the Josun interpretations in harmonious manner designed for the swordsmanship of Owari Yagyu-Shinkage-ryu school. Shinogi-zukuri, steep Iori-mune, Harmonious ration of Mihaba to Nagasa. Kasane is thick, shallow center point curve with moderate degree of tapering from base to the compact Chu-Kissaki. Forging(Hada): Forging is fine Ko-Itame-hada with conspicuous Itame-hada indications. Flowing ware partially appears from base to the middle. Steel gives off darkish blue impression to cover with sparkling hard metal martensite granules of moistened Ji-nie to generate Nie-utsuri on Hira-ji surface. Delicate lines of Nie so called Chikei activity wells out from an abyss of forging steel. Temper(Hamon): Hamon is medium Suguha of a bit on Nioi sided metal granules base, slight undulating Notare indication where works with sparkling Nie of martensite granules with indication of long lines of Nie Sunagashi, bright curved thread-like areas of Kinsuji, Hotsure and Niju-ha activities. In the interior of temper, there works with Noi mist-like crystalline area. Temper of tip (Boshi): Boshi forms refined wide Suguha then medium circles turn back. Tang(Nakago): Nakago is in UBU original. One peg hole. Katte-sagari (slightly slanting left) filemarks and back ridge of Nakago is flat with Katte-sagari filemark. The signature is located in front along Shinogi-suji, starts with an official district title Higo-no-kami 肥後守, pseudonym of Hata 秦 and smith name MITSUHIRO 光代. MITSUYO (or another pronunciation MITSUSHIRO) 光代 with the pseudonym of Hata 秦, surname Ito 伊藤 is said to be originated in Yamashiro. He stayed in Seki town, Mino domain then was adopted into E'chu-no-kami SADAYUKI 越中守貞幸 in Owari but somehow or other he broke off relations to be independent. Fortune made him to work exclusively for a great swordsman Yagyu-renyasai TOSHIKANE 柳生連也斉厳包 then later learned from Tsushima-no-kami TSUNEMITSU 対馬守常光 by his mediation. He enjoyed an official district title of Higo-no-kami 肥後守 granted by the Imperial Court during Kanbun era (1661-), lived in Nishi-kaji-cho (now Nishiki-2-chome, Naka-award, Nagoya) then moved to Minami Monzen-machi. 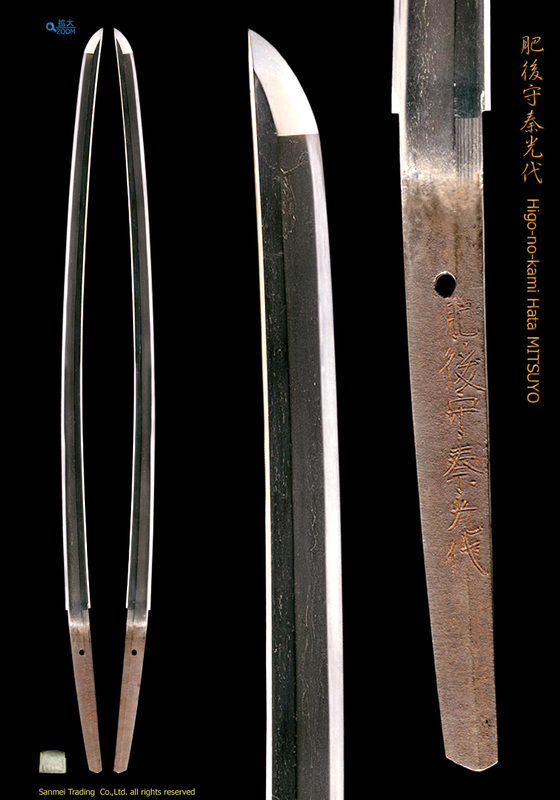 Well-known work by Hata MITSUYO - a wakizashi named Oni-no Houcho 鬼之包丁was exclusively made for Yagyu-renya TOSHIKANE and is his most distinguished work with great pains and also the most famed Daisho-set of Kago-tsurube 籠釣瓶 and Sasa-no-tsuyu 笹の露 had been owed by Yagyu-renya TOSHIKANE in his lifetime. In Tokugawa Art Museum collections, an odd shape wakizashi work of Ito Higonokami Hata Mitsuyo for Yagyu Toshinobu 柳生利延, tested to vivisect two bodies 伊藤肥後守秦光代　重胴二以其歯タウリ　柳生氏利延所持之 and wakizashi of "Gou YOSHIHIRO" reproduction 郷義弘 the work of Tsushima-no-kami TSUNEMITSU 対馬守常光, both have been treasured of Owari Tokugawa feudal clan and also Owari Yagyu swordmans school. 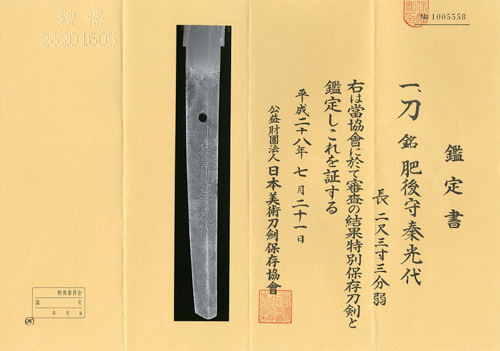 The number of extant works by the swordsmith MITSUYO 光代 is comparatively small because they were only made to order of Owari yagyu swordsmanship. Copper ground silver foiled Habaki collar, preserved in Shirasaya plain wood mounting. Good old polish/Condition scale: excellent (using a scale of mint-excellent-very good-good-fair-poor).